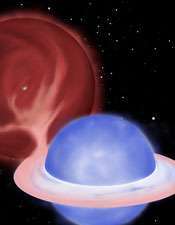 (PhysOrg.com) -- Mysterious "blue stragglers" are old stars that appear younger than they should be: they burn hot and blue. Several theories have attempted to explain why they don't show their age, but, until now, scientists have lacked the crucial observations with which to test each hypothesis. The majority of blue stragglers in their study are in binaries: they have a companion star. "It's really the companion star that helped us determine where the blue straggler comes from," said Northwestern astronomer Aaron M. Geller, first author of the study. "The companion stars orbit at periods of about 1,000 days, and we have evidence that the companions are white dwarfs. Both point directly to an origin from mass transfer." Geller is the Lindheimer Postdoctoral Fellow in the Center for Interdisciplinary Exploration and Research in Astrophysics (CIERA) and the department of physics and astronomy in Northwestern's Weinberg College of Arts and Sciences. Robert Mathieu, professor of astronomy and chair of the astronomy department at UW-Madison, is co-author of the study. The light from the blue stragglers' companion stars is not actually visible in Geller and Mathieu's observations. While the companions haven't been seen directly, their effect on the blue stragglers is evident: each companion pulls gravitationally on its blue straggler and creates a "wobble" as it orbits, and this allows astronomers to measure the mass of the companion stars. The WIYN data show that each companion star is about half the mass of the sun, which is consistent with a white dwarf. "We think we have a good understanding of stellar evolution, but it doesn't predict blue stragglers," Geller said. "People have been trying to explain the origin of blue stragglers since their discovery in 1953, and now we have the detailed observations needed to identify how they were created. I've always enjoyed trying to get to the bottom of a mystery." "As so often happens in astronomy, it is the objects that you don't see that provide the critical clues," said Mathieu, an expert on binary stars. "Now we will use the Hubble Space Telescope to search for the ultraviolet light in which white dwarf secondary stars shine." Geller, Mathieu and their colleagues will have, in about a year's time, observations from Hubble that will tell them if the blue stragglers' companions are indeed white dwarfs. More information: "A Mass Transfer Origin for Blue Stragglers in NGC 188 as Revealed by Half-Solar-Mass Companions" Nature, Oct 20, 2011. If "blue stragglers" are old, is the value of the He/H ratio higher than in younger stars? Since they continually gain new mass (presumably mostly H from the outer layerst of the companion) that depends entirely on the rate of gain and the amount already gained. The longer burn time would increase He ratio but the gained mass would decrease it.